Your body works to naturally detoxify itself every day. However, the amount of emotional and environmental stress you experience might be too much for your body’s natural systems to keep up with. The Infrared Sauna takes some of the load off your body by helping you sweat out the toxins and unwind chronic tension in muscles. Your body emits infrared heat naturally. 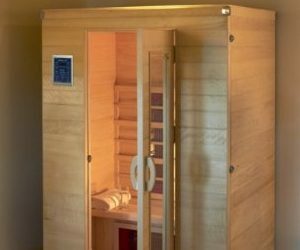 The Far Infrared Sauna, which works only with safe frequencies of energy, will gently increase that heat to a fever-like state. When the body is that warm, healing and restoration can occur. Helps heal varicose veins, etc. The more frequently you use the sauna, the greater the benefits. You can come every day!